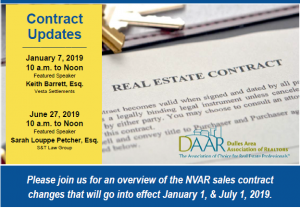 You’re invited to learn about updates to NVAR Standard Forms on Monday, January 7, 2019, 10AM-12PM, DAAR, Ashburn. Featured speaker Keith Barrett, Esq, Vesta Settlements, will review and answer questions regarding the latest changes effective January 1st, 2019. Free for DAAR Members. Register online here.